I had more time to play today so I combined another sketch and color challenge. First, I used the sketch from FabFri#83 here. And then used the color combination from Can You Case It#113 here. The colors to use are Navy, Kraft and Gray. I used Night of Navy, Basic Gray and Crumb Cake. 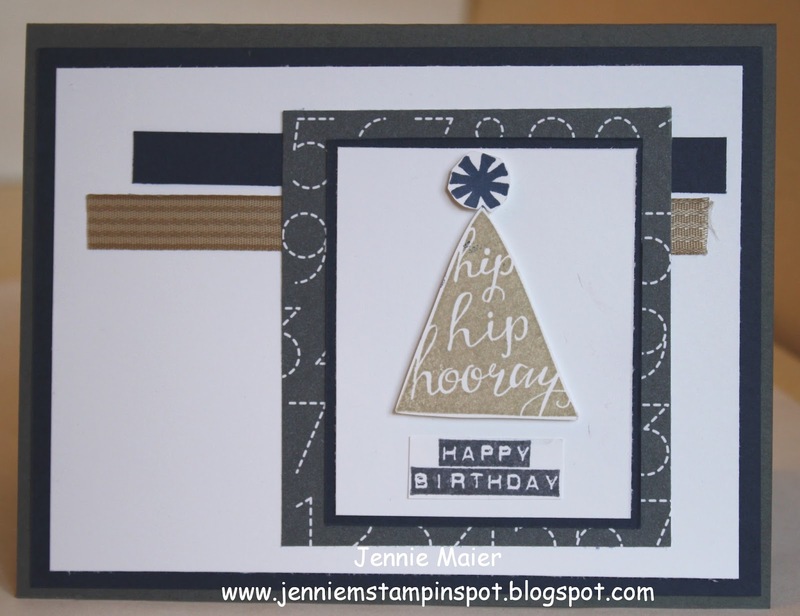 Silhouettes and Script is the stamp set with some Schoolhouse DSP. Totally fun, great colors! I love the masculine card and the way you put this together! Oh, cute! What a perfect manly card in these colors - I have to get this set out again! Love your ribbon choices! Thanks so much for playing at Fab Friday! Very cool card!! Perfect masculine card!! Thank you for joining us at Fab Friday!! I am really going to have to remember this awesome color combination the next time I need to make a guy card! You combined it wonderfully with our sketch Jennie! Thanks for sharing at Fab Friday! This is so simple and I love it! The neutral colors are elegant while still being fun! Thanks for playing at Fab Friday!